The first chakra is named Indu which means moon owing to the fact that the earth has only one moon. The second chakra is called Netra owing to the fact that we have two eyes. The fourth chakra is called Veda as the Vedas are four. The fifth chakra is called Baana owing to the 5 arrows used by Kamadeva. The sixth chakra is called Rutu after the six seasons in nature. The seventh chakra is called Rishi after the Saptarshis. The eight chakra is known as Vasu after the eight sons of Ganga. The tenth chakra is called Disi due to the 10 directions. The eleventh chakra is called Rudra after the 11 Rudras. The twelfth chakra is called Aditya after the 12 Adityas. Raga Pravaham is an outstanding compilation work done by Kalaimamani Smt. D.Pattammal with the support of her husband Dr. M.N.Dhandapani. They have provided the Arohanam and Avarohanam for over 5000 ragas classified into the representative mela ragas and chakras, referring to over 45 books in 5 languages. Dr. M.N. Dhandapani and Mrs. D. Pattammal have used 59 sources in Tamil, Telugu, Kannada and English in their compilation work. 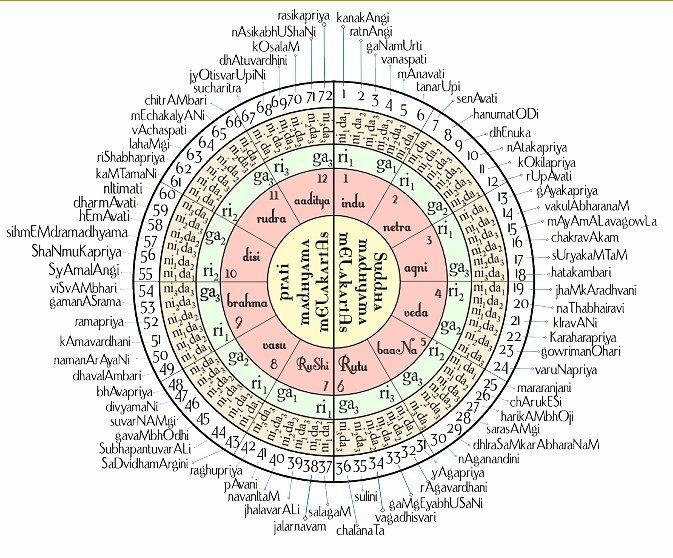 Each of the sources have been given a symbol like A, D, AG, etc and these symbols are marked against each Arohanam and Avarohanam. Whenever, any raga has more than one Arohanam and Avarohanam and you want to know the source, please refer the Bibliography to identify the source. Late Sangeetha Kalanidhi Sri. Ramanatha Iyer was an initiator, motivator and the guiding force for this monumental work. This will benefit all mucisians, musicologists, teachers, students of carnatic music and music lovers. Music is an extremely subjective experience. Some of the sound waves that reach the human ear are perceived to be pleasant while others are unpleasant and merely termed as noise. Thus, music is the art of combining sounds with a view to beauty of expression of emotion. Musically good melodies are thus harmonious in character. Mathematics is the basis of sound wave propagation, and a pleasant sound consists of harmony arising out of musical scales in terms of numerical ratios, particularly those of small integers. Mathematics is music for the mind while music is mathematics for the soul. A suitable permutation and combination of some basic notes gives rise to melodious music which enthrals and transports one to a new enjoyable experience. While theoretically infinite possibilities can be thought of, only 279 had been in vogue. In Carnatic music, seven notes or swaras as they are called, form the foundation of the various permutations and combinations. Theoretically, one can mathematically think of 7! = 5040 possibilities. But only 72 of them, called Janaka ragas, have been analyzed and found to have practical usage from the melody point of view. A raga thus has a set of rules that specify what notes of the octave must be used under the given rule and how to move from one note to the other. A Melkartha raga must necessarily have Sa and Pa and one of the Mas, one each of the Ris and Ga’s, and one each of the Dhas and Nis, and further Ri must precede Ga and Dha must precde Ni, and thus we have 2 x 6 x 6 =72 possibilities of the Melakartha ragas. In the Carnatic music system also, just as in the Western music system, some of the swaras have small variants, and according to some scholars, 22 such notes are possible with the ratios as given below to the fundamental Sa. But according to some scholars, Ma has only 2 variants while Ri, Ga, Dha and Ni have only 3 variants each while Sa and Pa are fixed, and Venkata Makhi has followed this system in his classification of the ragas in vogue. Although many ragas might have been in existence earlier, it was first Venkata Makhi who made a classification of the ragas by allotting them a number in what is called the Melakartha system, by adding prefix to the existing ones wherever necessary, following the katapayaaadi system of numbering; he considered a raga to be a Melakartha raga only if all the 7 swaras were present in the regular order in the ascending as well as descending mode. Govindacharya, however, allowed some freedom in this respect, and permitted deviation of the order as well as absence of any particular swara in either mode provided all the 7 swaras were present. Melakartha ragas have a swara pattern, with arohanam and avarohanam, the latter being the mirror image of the former, and both together make a musical palindrome! The 72 Melakartha ragas, according to Venkata Makhi, consisting of all the 7 swaras in the ascending as well as descending mode in proper order, are called Janaka ragas or parent ragas, and other ragas which arose out of them with absence of one or more of the 7 swaras were called Janya ragas (offspring ragas). The Janya ragas are derived from the 72 fundamental set by the permutation and combination of various ascending and descending notes, and matematically about 3000 such janya ragas are possible. The 72 Melakartha raga system was responsible for the transformation of the raga system of carnatic music. Many new ragas came into existence and were popularised by great musical savants like Saint Thyagaraja, Muthuswami Dikshitar etc. and many different kinds of musical compossitions were developed with different structural arrangements. The musical forms included Varnam, Kriti, Padam, Javali, Tillana, Swarangal, Swarajati etc. The genius of the musician consists in how he can move to intermediate frequencies between those specified by the seven basic notes, and create microtones melodious and pleasing to the ear, called gamakas. (When one talks of the intermediate frequencies one is reminded of the Raman Effect discovered by the renowned Indian Nobel Laureate in Physics, Sir C.V.Raman. While studying the spectra of fluids, he found that there were frequencies intermediate between those predicted according to Bohr’s postulates, and he was able toexplain them as being due to intermediate energy levels arising out of further degrees of freedom of the fluid molecules giving rise to vibrational, rotational etc. spectra). The following verse found in Śaṅkaravarman’sSadratnamāla explains the mechanism of the system. Translation: na (न), nya (ञ) and a (अ)-s i.e. vowels represent zero. The (nine) integers are represented by consonant group beginning with ka, ṭa, pa, ya. In a conjunct consonant, the last of the consonants alone will count. A consonant without vowel is to be ignored. The assignment of letters to the numerals is as per the following arrangement. Consonants have numerals assigned as per the above table. For example, ba (ब) is always three 3 whereas 5 can be represented by either nga (ङ) or ṇa (ण) or ma (म) or śha (श). All stand-alone vowels like a (अ) and ṛ (ऋ) are assigned to zero 0. In case of a conjunct, consonants attached to a non-vowel will not be valueless. For example, kya (क्या) is formed by k (क्) + ya (य) + a (अ). The only consonant standing with a vowel is ya (य). So the corresponding numeral for kya (क्या) will be 1. There is no way of representing Decimal separator in the system. Indians used the Hindu-Arabic numeral system for numbering, traditionally written in increasing place values from left to right. This is as per the rule aṅkānām vāmato gati (अङ्कानाम् वामतो गति) which means numbers go from left to right. The moment the name of a raga is given, the above system is used to find the Melakartha of that raga. Sometimes to fix the correct number, the name of the raga is slightly changed, as for instance, Sankarabharanam is called Dheerasankarabhaaranam, and Kalyani is called Mechakalyani and so on. Let us consider some examples. Take Mayamalava Gowla. Here, Ma stands for 5 and ya stands for 1. So, the number we get is 51, and as per the reversing rule, the number of the Melkartha is 15. Then, consider Simhendra Madhyamam. Sa stands for 7, and Ma for 5. The number is 75 and on reversing it is 57, which is the Melakartha of this raga. (The second consonant ha has number 8, and on reversal would give 87 as melakartha raga which is nonexistent. Hence, ma is taken in simha as the second consonant). Now, consider Vachaspati. Va stands for 4, and cha for 6, and the number is 46 which on reversing gives 64 as its Melakartha. Sa and Pa are taken as fixed for all the Melakartha ragas. The question arises which variant of Ri, Ga, Ma, Dha, Ni figures in what parent raga. For ragas whose Melakartha number is 36 or less, M1 is chosen and for ragas whose Melakartha number is 37 or more, M2 is chosen. Step 1: First, find the number of the Melakartha raga using the Katapayaadi system. Suppose it is K.
Step 2: Consider [[K/6]], called the ceiling function of K/6, that is, the integer which is equal to greater than K/6. e.g. Suppose K is 31. Then 31/6=5.1…, and [[K/6]] is 6. If K is 30, then [[K/6]] = 5. If [[K/6]] > 6, then take mod 6 of that number arrived at. Step 3: Now, consider K modulo 6. Since this number will lie between 0 and 5 only, we make this lie between 1 and 6 by setting 0 as 6. If K is 31, then 31 = 1 mod 6. So, we consider only 1 for the procedure to be followed as outlined below. In the example considered in step 2, we have the number 6 corresponding to (3,3), we have Ra3 and Ga 3. Step 5: In step 3, we had 1 as residue after dividing 31 by 6. So, 1 corresponds to (1,1) as indicated above. So, the swaras chosen are Dha1 and Ni3. 31 < 36, and hence we have Ma1. Sa Ni1 Dha1 Ma1, Ga3, Ra3 and S in avarohana. Ex. :Now, let us consider another example: consider Shubhapanthuvarali: Sha stands for 5 and bha stands for 4, so, the number is 54, which on reversal gives 45. 45 > 36, and hence we have Ma2. To sum up, if [[K/6]] is as defined above, then in this case [[45/6]] =8 = 2 mod 6. 2 corresponds to (1,2), and hence we have Ri1 and Ga2. 45 = 3 mod 6. 3 corresponds to (1,3) in the matrix, and so, we have Dha1 and Ni3. (i) Find the Melakartha number of the raga with the katapayaadi system. Suppose it is K.
(ii) If K = 36 or <36, then we have Ma1. If K >37, we have Ma2. (iii) Consider [[K/6]] = a. If a is > 6, take mod 6 of a, suppose it is a*, then find the element in the matrix corresponding to a* which lies between 1 and 6 only. That will decide Ri and Ga.
(iv) Now, consider K = b mod 6. Find the element corresponding to b in the matrix, and that will decide Dha and Ni. A list of the Melakartha (Janaka) ragas as well as the janya ragas under them and also those not associated with them or whose scales are not yet added is given in appendix 1. The Cavery delta, peaceful and prosperous one under the administration of the enlightened Maratha kings of Tanjore, saw a huge influx consequent to political upheaval in the surrounding areas during the year 1742. Dikshithar ancestors too migrated at that time to the State of Tanjore and settled down in a village called Govindapuram. Ramaswamy Dikshithar, father of Muthuswami Dikshithar was 7 years old at that time. Ramaswamy Dikshithar grew up to become a great musician, believed that no music could be perfect unless it was based on a firm foundation of theory. Muthuswami acquired profound scholarship in the ancient sastras. His father gave him intense training in the ‘lakshya’ and ‘lakshana’ aspects of Carnatic music. The lakshana geethas and prabandhas of Venkatamukhi formed an important part of the training. Raga Hamsadhwani is the creation of Ramaswamy Dikshithar. In fact, his compositions would have received far greater recognition and wider popularity had his son Muthuswami Dikshithar not overshadowed him. Ramaswamy Dikshithar, father of Muthuswami, was childless till his 40th year. In the month of Phalguna, the annual Vasantotsava time in the Thyagarajaswami temple, a baby boy was born to him, and he was named Muthuswami, after God Kartikeya. Later on, two more sons – Chinnaswamy and Baluswamy and a daughter Balambika – were also born to Ramaswamy Dikshithar. Muthuswamy’s exposure to the East India Company at Madras and visits to Fort St George gave him several opportunities to listen to Western music. On the suggestion of Col Browne of the East India Company, Dikshitar composed the text in Sanskrit for English tunes. A far more important benefit that accrued from the association of the Dikshithar family with Western music was the adoption of the violin as a regular concert instrument. Muthuswami, his father and brothers, often listened to the orchestral music played by the band and were deeply impressed by the important role assigned to the violin in the concert. They wondered why the violin could not replace the veena as an accompanying instrument. Since Muthuswami had already taken to the veena, his brother Baluswamy started learning violin under an European tutor. Before long Baluswamy acquired such mastery over the instrument that he accompanied Muthuswami in a veena concert. 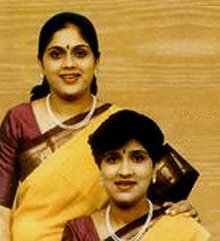 What began as an experiment soon became a permanent feature of Carnatic music concerts. Muthuswami, along with his two wives, went to Kasi with Chidambaranatha Yogi. He was about 24 years age at that time. Muthuswami lived for about six years in Kasi. This was the most significant period in molding the personality of Muthuswami Dikshitar, in whom we find. a synthesis of Veda, Purana, Alankara, Jyotisha, Agama, Yoga, Mantra, and Tantra, which are abundantly reflected in his compositions. His exposure to Hindustani music during this period, had a profound influence on his creative genius which becomes apparent not only in his handling of the Hindustani ragas, but also in the portrayal of ragas in general. He composed a number of kirtanas in Yamuna Kalyani (Yaman of Hindustani music) and among them special mention is to be made of the kirtana Jambupathe mam pahi, for its richness of ragabhava and grandeur. Parmala Ranganatham in Hamir Kalyani brings out the salient features of the raga as delineated in Hindustani music. Chetha Sri Balakrishnam in Dwijavanthi portrays the raga in all its varied hues. While bathing in Ganga, before returning from Kasi, Chidambaranatha Yogi told Dikshithar to go three steps down in the Ganga and tell him what takes place. Dikshithar did as was told and to his great surprise, a Veena with the word Rama inscribed on it drifted into his hands, a gift from Ganga Devi. Muthuswami Dikshithar is a prolific composer. His compositions consist mainly of kirtanas . Besides, there are five ragamalikas, a pada varna and a daru. Dikshitar’s compositions are mostly in Sanskrit. A few of them are what are known as Manipravala compositions. The most outstanding feature of his compositions is their rich ragabhava. If a composition is hummed, leaving out the sahitya, it can easily be mistaken for a ragalapana. His kirtanas can be described as ragalapana dressed in sahitya and artistically accommodated in the framework of tala. For many old ragas such as Mangala Kaisiki, Narayana Gaula and Gopika Vasantha, we have to fall back on Dikshitar’s compositions to understand the lakshana aspects. There are again ragas like Saranga Nata, Chhaya Gaula, Mahuri and Kumudakriya which have been handled only by Dikshithar. His kirtanas are slow in tempo, ideally suited for the portrayal of ragas. The veena, his favorite instrument, is the best suited to bring out the gamakas. Accordingly, rich usage of gamaka is another outstanding feature of Dikshitar’s compositions. Through Navagraha Kirtanas, devoted to the nine planets to propitiate the Navagraha through music, Dikshithar has shown the way to earn the divine grace of the Navagrahas through music as an alternative to the age-old mode of tantric worship. The most famous Navavarna kirtanas based on the adoration of Sakthi through the worship of Sri Chakra. These compositions are called Kamalamba Navavarna Kirtanas, even though they are devoted to the worship of Sri Chakra. This is because Dikshitar identified the Supreme Mother with Kamalamba, the consort of the presiding deity of Tiruvarur. The Navagraha Kirtanas and the Navavarna kirtanas are his famous group compositions. In the month of Aswija, on the Chaturdashi preceding Deepavali, Muthuswami Dikshithar after yogic practices performed Navavarna pooja to the Devi (Godess) and sang Ehi Annapoorne. After the pooja Dikshithar moved on to the hall where, while his disciples at his request were singing Meena lochani Pasha mochani, he passed off peacefully to eternity. Not often do you encounter personalities who create classic works of art that survive beyond their lifetime. It is even less often that a composer creates such a classic that integrates history, tradition and musical sophistry in a complex and intriguing portrait. It is even less often that we encounter a composer creating a group of such classics in a premeditated planned manner that integrates so many elements of culture, yet showing a thread of continuity between the individual classics. The Pancha bhuta stala krits of the revered composer Muthusvami Dikshitar are a stunning example of such a portrayal of the stalapuranas of five distinct temples located miles apart from one another in South India, primarily in the Tamil speaking region. Each phrase in each of these classics has a story to tell; this feature limits itself to a very brief introduction to each of the kritis and the reference to the five elements. In his classic chintaya maakanda, Dikshitar venerates Shiva as Somaskanda (as the trinity of Shiva, Uma and Skanda) enshrined in Kanchipuram. Indeed, the juxtaposition of the Kumarakottam temple in the space between the Ekamranatha and the Kamakshi temples is a spatial illustration of the concept of Somaskanda. It is a known fact that none of the Shiva temples in Kanchi has a shrine dedicated to the mother Goddess. A Somaskanda panel adorns the sancta in a representation of Shakti united with Shiva along with Skanda. It is in Kanchi that Shiva is venerated as a representation of the element earth, that constitutes one of the five bhutas or elements that is vital to creation. It is in this composition that Dikshitar venerates the beauty of the image of Shiva in the form of Shiva, with a beautiful smile and a brilliance that shadows Kama the lord of Love. The raga mudra is brought out with the phrase ‘bhairavi prasangam’ in the madhyama kala phrases of the composition as is the phrase prithvi lingam. The kriti Sri Kalahastisa in the raga useni is an offering to the veneration of Shiva as ‘Vayu lingam’ and an acknowledgement of the element ‘air’ as one of the five elements that constitutes life. Shiva’s consort here is Jnanaprasunambika and the shrine at Kalahasti is considered to be on par with Kailasha (one of the most revered places of worship in the Saiva tradition). The reference to the element air comes in the form of sameeraadhaara (the basis of the element air). The kriti also draws attention to the stalapurana that celebrates Kannappa Nayanar’s devotion to Shiva. 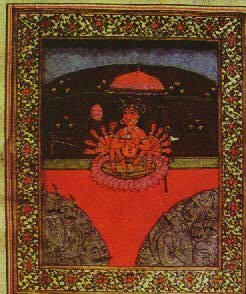 The reference to Shiva as a personification of nothing other than true bliss (sat chit anandam) is a theme that occurs both in the prithvi linga kriti as well as in sri Kalahastisa. Arunachala Natham is a classic that at once invokes a sense of majesty associated with the shrine at Tiruvannamalai. Shiva is venerated as the Lord of Apitakuchamba (Unna mulaiyaal). smaraNAt kaivalya (i.e. access to liberation from the cycle of birth and death upon meditating upon Tiruvannamalai) is a phrase that marks the beginning of the anupallavi of the kriti. Again the phrase ‘chidanandam’ makes an appearance in this kriti. Shiva is referred to as ‘Tejomaya lingam’ (a fiery Shivalingam as symbolified by the hill and by the annual kartikai deepam that is lit at the culmination of the bhrahmotsavam atop the hill) and the raga mudra ‘sarangam’ appears in the phrase ‘kara dhrita sarangam’ referring to the deer adorning Shiva’s arm. Jambu Pate is a classic in the raga Yamuna Kalyani and it has reference to the water bodies such as Yamnua, Ganga, Kaveri, the ocean and it venerates Shiva as pancha bhuta maya prapancha prabhu. It also refers to the legend of the elephant that renders the name Tiruvaanaikkaval to the town, through the phrase ‘saamajaatavi’. Again, Shiva is referred to as the personification of true bliss (nijaananda). The fifth in the series of these kritis is Ananda Natana Prakasam in the raga kedaram. Set at a leisurely pace (as are the rest of the kritis), this kriti in a seven beat cycle salutes the brilliance of the cosmic dance of the Universe and the cosmic dancer Shiva, the Lord of the chit sabha. Needless to say, the theme of supreme bliss occurs right away as the opening phrase of the kriti extoling the glory of the hoary temple at Chidambaram. It is in this kriti that an explicit reference to the non dual nature of existence (advaita pratipaadyam) occurs, although this nature of being has been implicitly referred to in the other kritis. The phrase daharaakaasam refers to the fifth element aakaasha or space. Listening to a dignified rendition of these kritis is a profound experience, especially if one keeps in mind the significance behind the traditions associated with the five temples that have survived the test of time, a one of a kind grouping of monuments that are linked in so many different ways not seen elsewhere in the world. The author Kanniks Kannikeswaran is scheduled to present ‘Nottusvara Sahityas of Muthusvami Dikshitar’ – a lecture demonstration at the Music Academy, Chennai during this music season.